Back in July a friend took me to Nellie’s Kitchen for brunch, one of the many Nellie’s restaurants in Calgary. I’ve seen mixed reviews of the various Nellie’s locations on Chowhound, so I was wary but was still willing to go for it. The place was almost full, but we managed to snag a seat in their back garden. Normally, I imagine this place is full to the brim with people, but I was in Calgary during the Stampede and I had a feeling that a lot of people hadn’t woken up to their hangovers quite yet. 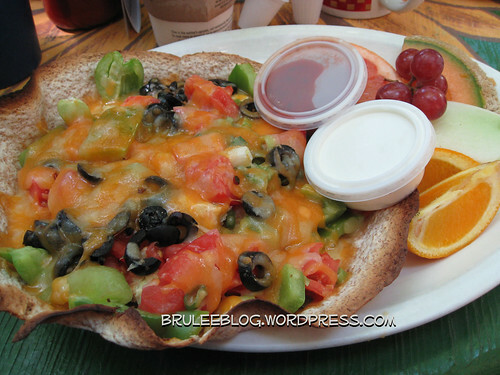 The menu was a fairly standard breakfast menu, and I opted for something that was kind of healthy but also cheese-laden. My meal was a fairly large huevos rancheros brimming with veggies, and served with salsa, sour cream and fresh fruit on the side. I was so full I was ready to roll out the door. Oh my Lord! Where are the huevos? Whatever. That looks super tasty! I dined in for breakfast at Nellies Restaurnt on Sunday morning. After order the food i was looking around the restaurant and notice many health issues with this location. The server had sat my friend and I beside this plant and toy microwave and cabinets and beside the exit door. You could literally see dust building up everywhere. they had fans that collected dust and customers were sitting beside these fans and objects where dust was building up. I have never once in my life gone into a resturant and seen anything like this before. It looked like they have dust or cleaned anything in months or who knows years. The food was great and i would probably go there to only pick up food for take out but i dont think i would go back until they clean up the restaurant a bit and wouldnt reccomend anyone to go there to dine in.